For as long as I can remember British food has had a bad wrap. Over cooked roast beef, greasy fish and chips are what come first to mind. London, like many other cities, is having a Culinary Renaissance. The food was specular during my last trip to London. 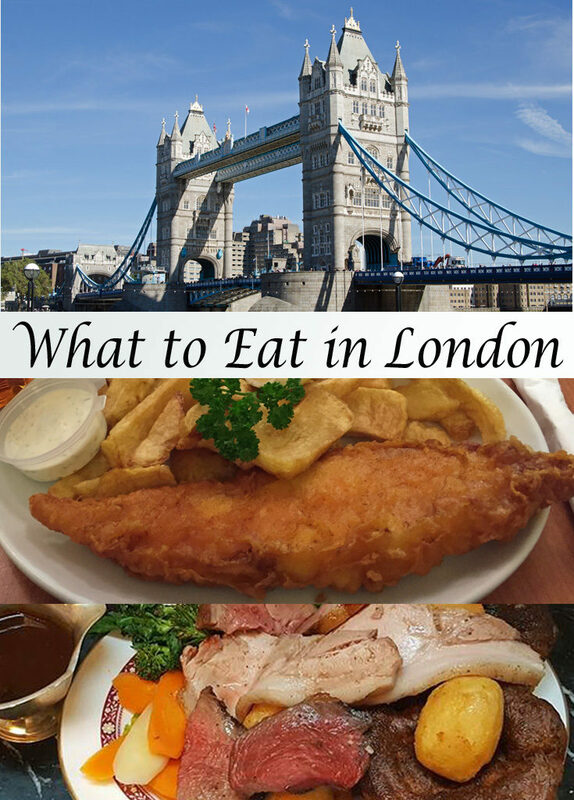 Today, I’m sharing my culinary “must eats” when visiting London. Overcooked roast beef and mushy vegetables are a thing of the past. 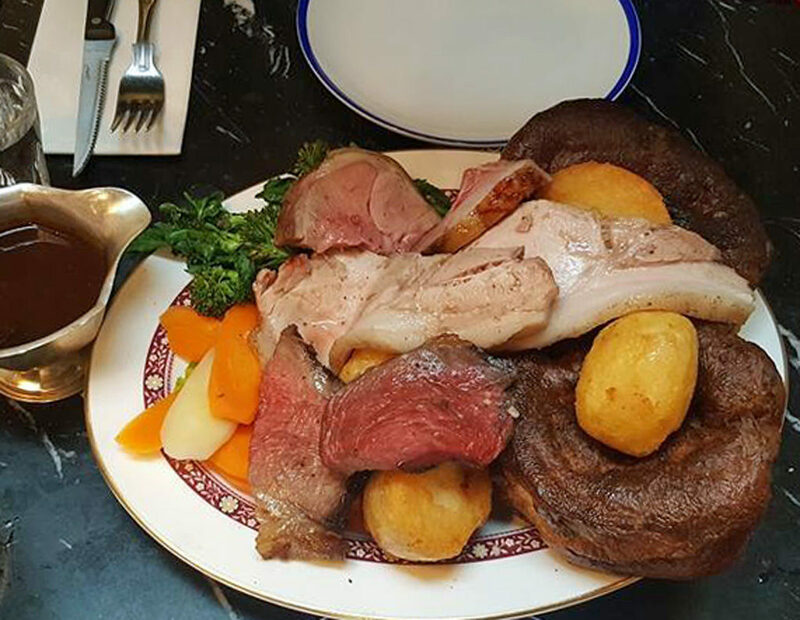 Restaurants in London today are cooking up mighty fine Sunday roasts. Think perfectly roasted duck fat potatoes, al dente vegetables, puffy Yorkshire pudding served with medium rare roast beef, juicy pork and lamb with a boat of rich and silky bone marrow gravy. 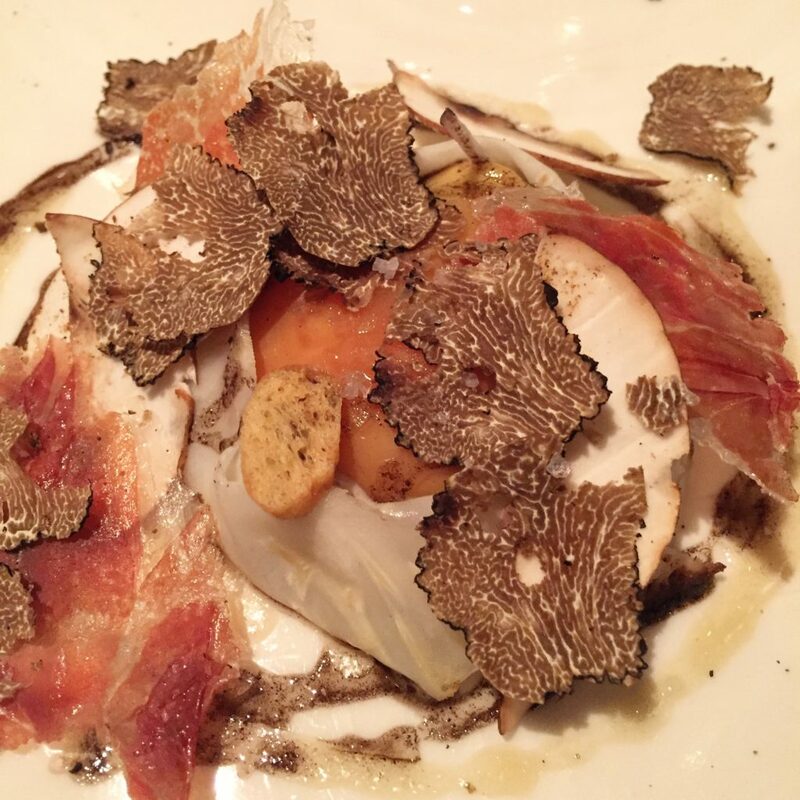 Our inaugural meal in London was at Blacklock, Soho. After an 8 hour flight, an hour in customs, a two 2 miles and a wicked case of jet lag I was ready to eat. Tucked in a basement, Blacklock serves up a seriously delicious meat platter on Sunday. There is nothing better than perfectly cooked fish and chips. 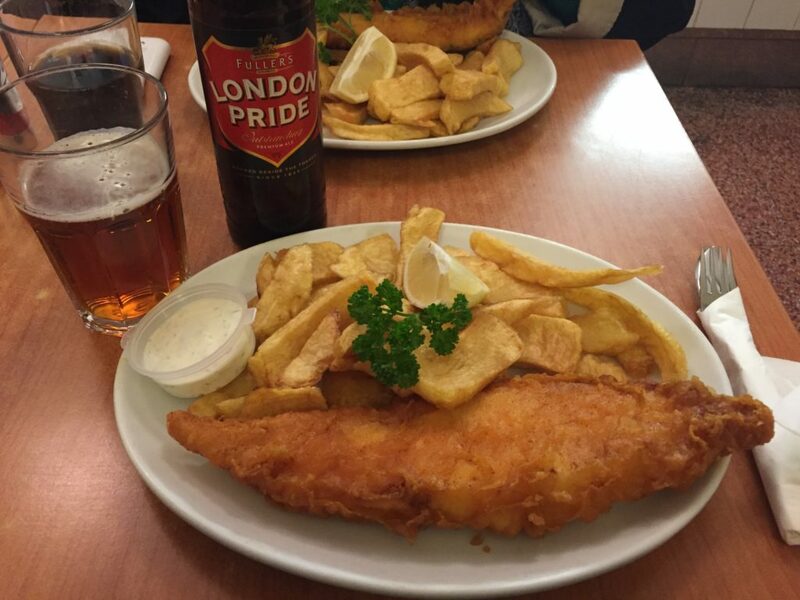 Well, actually there is, perfectly cooked fish and chips with a Fuller’s London Pride to wash it all down. When I was working in London in 2003-ish, The Rock & Sole Plaice was my go-to fish and chips place. Over 10 years later, it did not disappoint. I’m a huge fan of there super dilly tarter sauce and crispy fish. The chips are also chips, not french fries. It’s not fancy, but it is delicious. Cheese in Europe makes me want to move across the pond. Neal Yard in Borough Market is amazing. But my favorite is a smaller cheese shop in Old Sptisfield Market, Androuet. I recommend the Farmhouse Cheddar from Somerset. 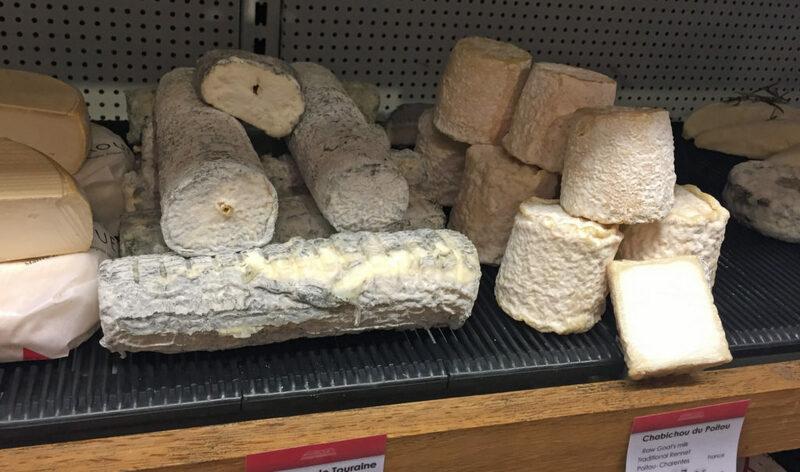 It’s made from raw cow’s milk and is wonderful with a glass of wine and some crusty bread. Did you know that you can bring cheese back into the US? Yes, yes you can. This cheese travels well and does not require cold refrigeration. British pub food, oh boy. I’ll be honest, I normally stick to fish and chips. But every so often there is a meat pie thing that sparks intrigue. Beef stew encased in dough then pummeled with gravy. It’s usually salty and filling and gets washed down with a beer. Sometimes you just gotta. 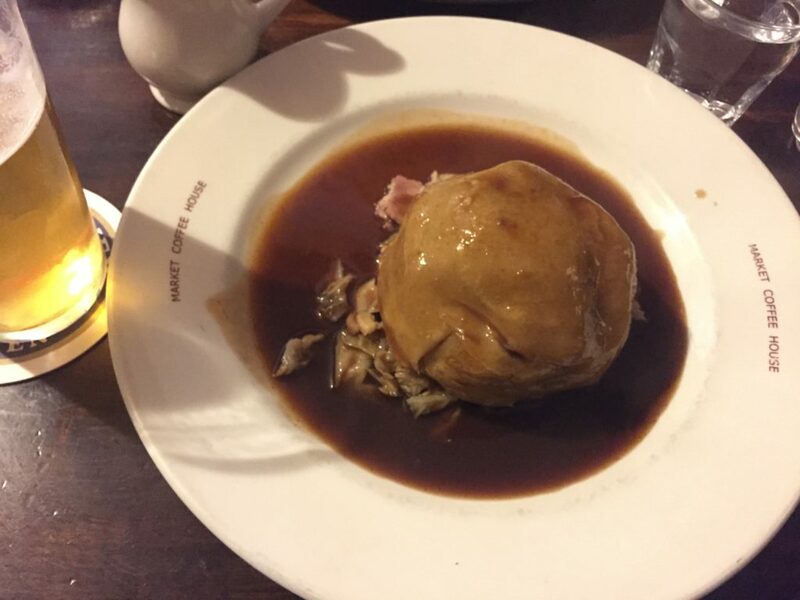 Pub food can be found across London. I have no special recommendation here. I will say this; look at what other are eating and take note. And if all else fails, order the fish and chips. 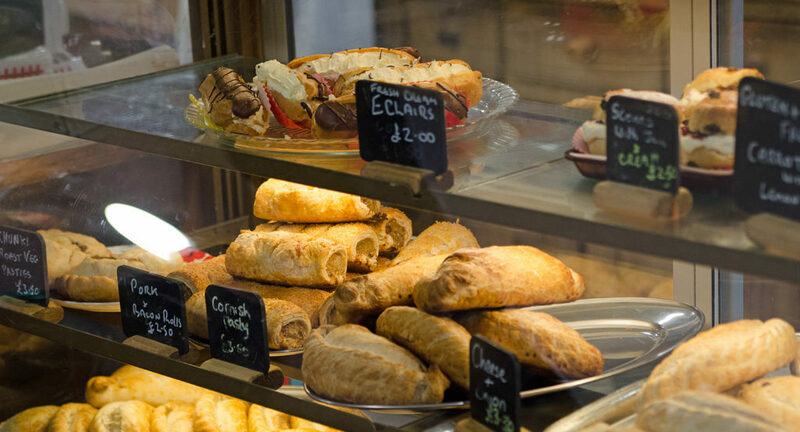 Cornish pastries are a meat pie delight. Beef, potatoes, turnips, and onions seasoned with salt and pepper are baked in a flakey pastry dough that is bushed with butter. Amazing hand food and great for a snack when you walking the streets of London. 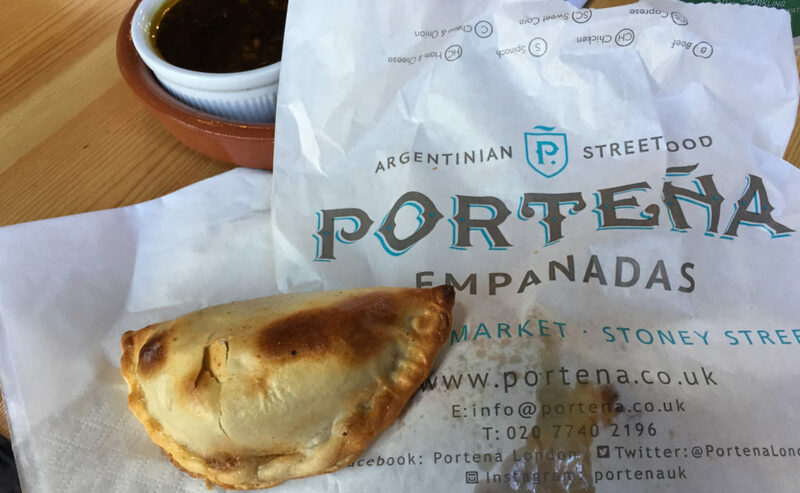 The best Cornish Pasty are not found in London (shout out to Ann’s Pasties in Cornwell, if you happen upon a trip – hit up the Lizard Pasty Shop) but there are couple of nice options in the city. My pick in London is Cornish Bakehouse. The crust is flakey and the filling is ample. Tea or the Queen? I’m not sure which is more important to the British. I’m going to go with the Queen, but if an anonymous survey was taken, I’m sure most Brits would choose tea. 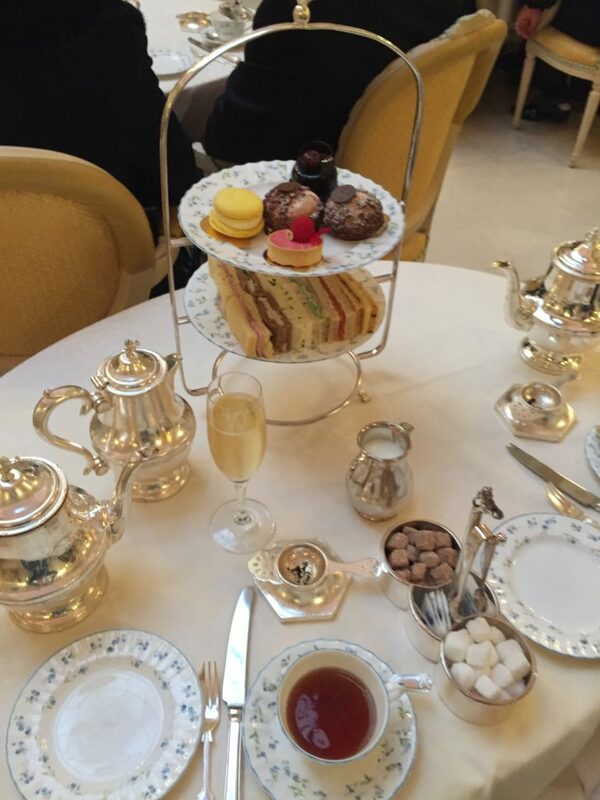 My favorite high tea in London is at the Ritz Hotel. It’s an iconic experience. A white glove service starts with champagne (optional) and progresses with sandwiches, scones with clotted cream and strawberry jam, with a cake (optional) finale. Hot tea and amazing service flows thought out. I’m partial Earl Grey and can eat the egg salad sandwiches by the dozen. The tea is served in the beautiful Palm Court and the ambience is enhanced with live music. London claims two spots on the top 50 restaurants in the world; The Clove Club #26 and The Ledbury #27. How to choose? Flip a coin. Or, one night head to the front of The Clover Club for a cocktail and a snack. Another night, make a reservation and enjoy the full tasting menu a The Ledbury. Or lunch at The Ledbury and dinner at The Clover Club (or vice versa). Best of both, I say. Open markets are plentiful in London. And some of the best international food is found in them. Old Spialfields Market, Camden Market and Borough Market are my favorites. I love the variety of cuisines they offer. Looking for a great bottle of wine and a fab-ul-ous cheese plate, head to Gordon’s Wine Bar. A vaulted cellar with original Dickensian-style decor make this magical wine bar the perfect place to head when you don’t want dinner but want to drink wine and nibble on cheese. 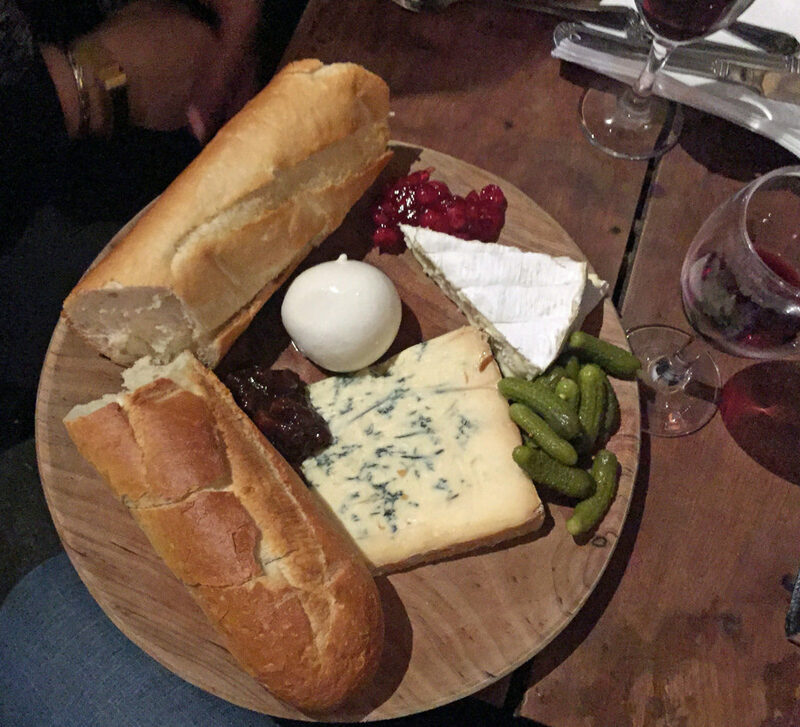 For £16.50 (about 20 bucks) you get an amazing cheese plate with fresh crusty bread. Paired with a reasonably priced bottle of wine, it’s a perfect place to unwind and enjoy the local London scene. As I said above, London is having a Culinary Renaissance. Pop-up restaurants are contributing to the food scene, bring new flavors and experiences. I know it’s a risk to not eat at a tried and true establishment but, if your into culinary adventure I say give one a try. 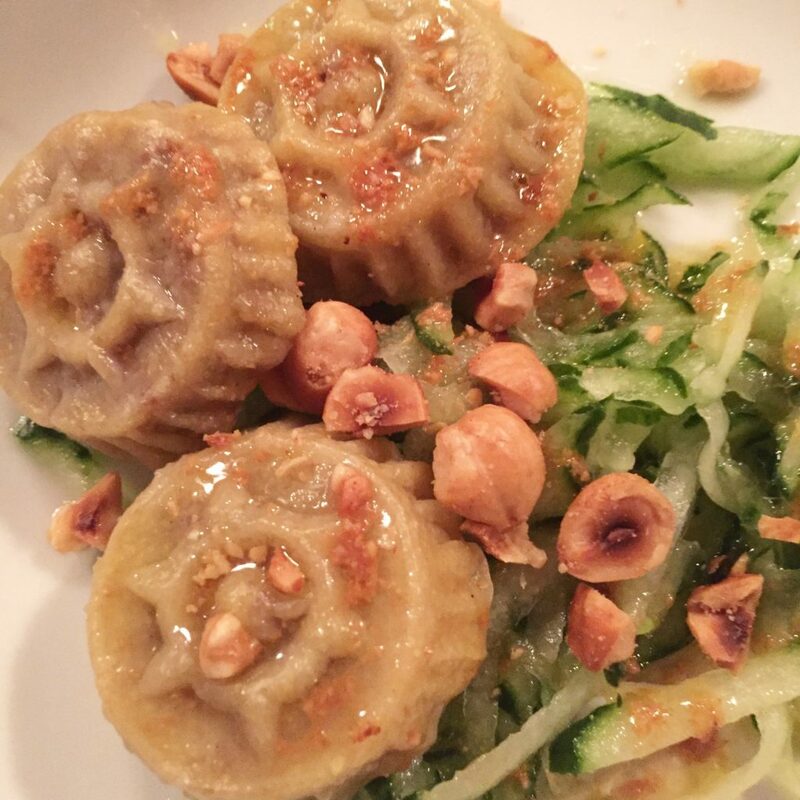 Carousel is a restaurant dedicated to bringing in guest chefs from around the world. Their chef line-up is well curated, the service is excellent and the atmospher is relaxed. We loved our dinner with Bethany Kehdy.